Cauliflower and tahini were meant to be together, and this dish proved it to me. The first time my mom made this Arabic dish for me, I could not believe something so delicious was centered around just two basic ingredients. The true beauty of this dish is in its simplicity. First, you just slightly steam the cauliflower and then begin to brown it, as the garlic and olive oil infuse it with flavor. Then you add the fragrant Mediterranean spices, sumac and cumin. While the cauliflower continues to crisp, you prepare the simple tahini sauce. This creamy, tangy sauce works beautifully with so many Middle-Eastern dishes, yet each combination of tahini and flavors is always unique. Finally before serving, you toast the pine nuts, releasing their irresistible aroma and crunch. Topped with the toasted pine nuts, chopped parsley, and an extra sprinkle of sumac, this simple, flavorful dish comes together in under half an hour for you to enjoy! 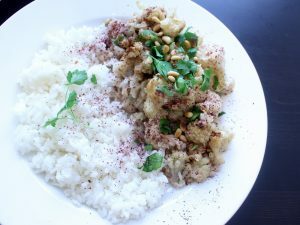 I love to serve cauliflower with tahini alongside white rice to soak up the flavors of the sauce and spices. 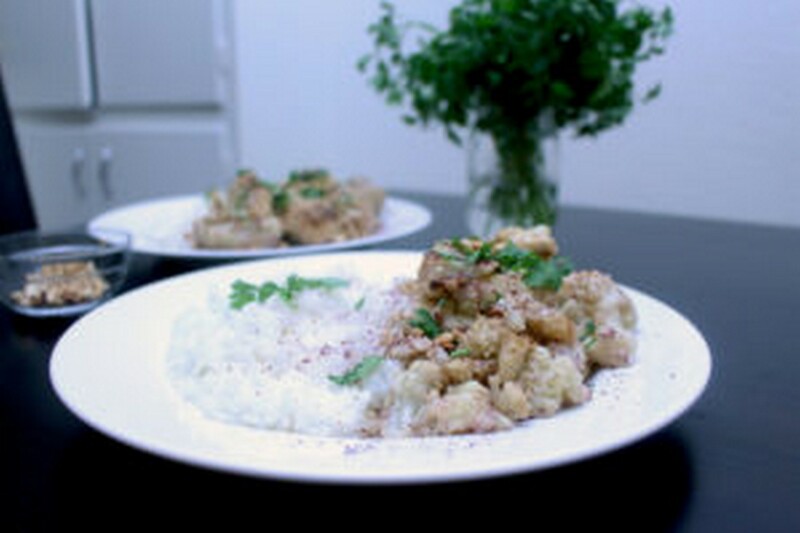 Fragrant cauliflower and tangy tahini join together with Mediterranean spices in this simple Middle-Eastern dish. Chop cauliflower into florets and microwave on high for 1-2 minutes. I heated ½ of the florets at a time, for 1 and a half minutes each. Cauliflower should just begin to be tender, but still maintain its texture and not become too soft. In a large saucepan over medium-high heat, sauté minced garlic in olive oil until fragrant, about 2 minutes, then add cauliflower. 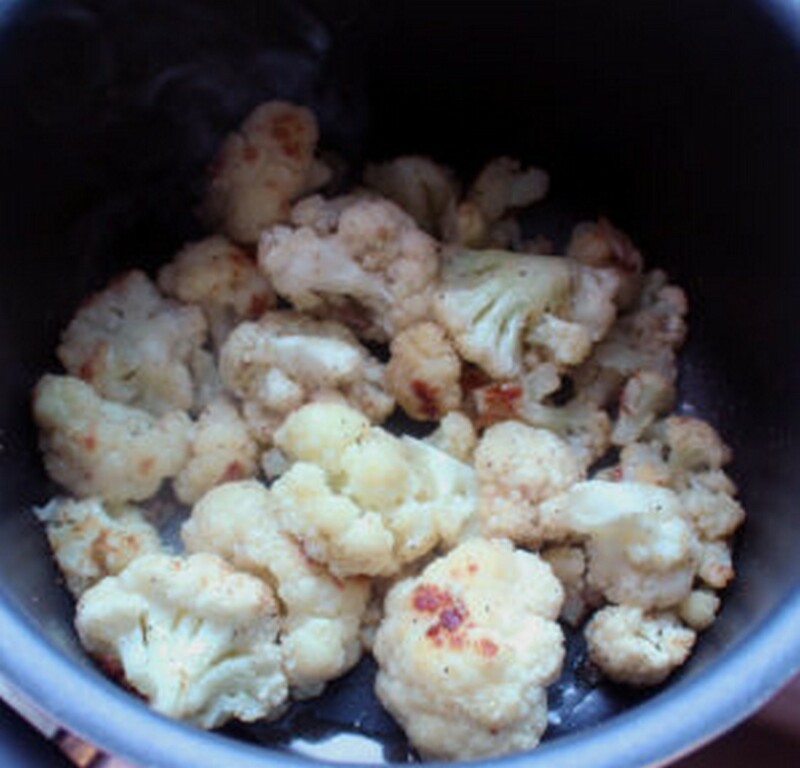 After about 5 minutes, once cauliflower starts to brown, add cumin, sumac, pepper, and salt. 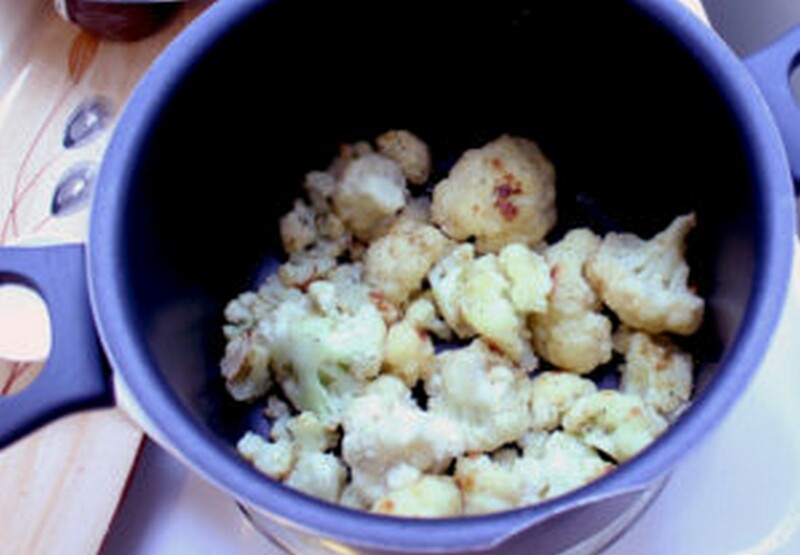 Continue to cook cauliflower for about 10-15 more minutes, until most florets are browned. Keep an eye on the cauliflower to make sure it does not burn. Meanwhile, prepare tahini sauce by whisking all ingredients for tahini together until no lumps remain. Dry toast the pine nuts in a small saucepan over medium-high heat, stirring or shaking frequently to make sure they do not burn. As soon as they start to brown, after 3-5 minutes, remove from heat and set aside. Remove cauliflower from heat and immediately pour tahini sauce over it while it is still hot. Stir through to make sure florets are evenly coated with tahini. 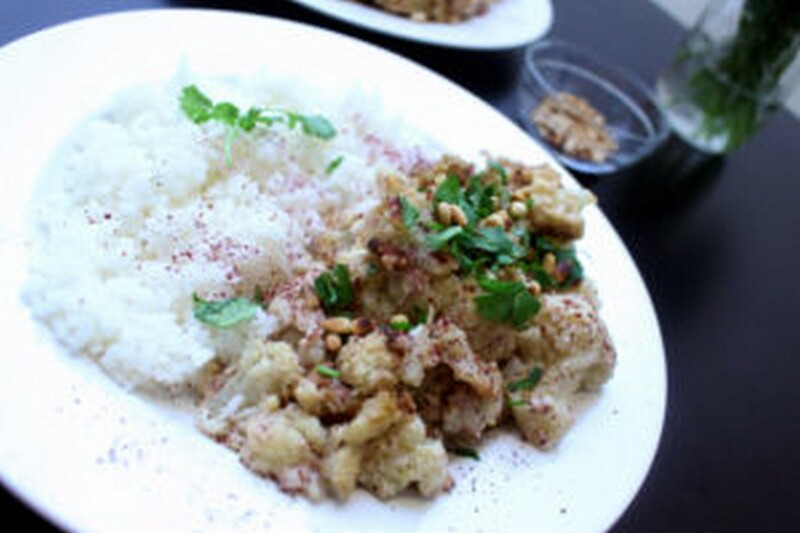 Serve immediately alongside rice or pita bread, and top with chopped parsley and toasted pine nuts.